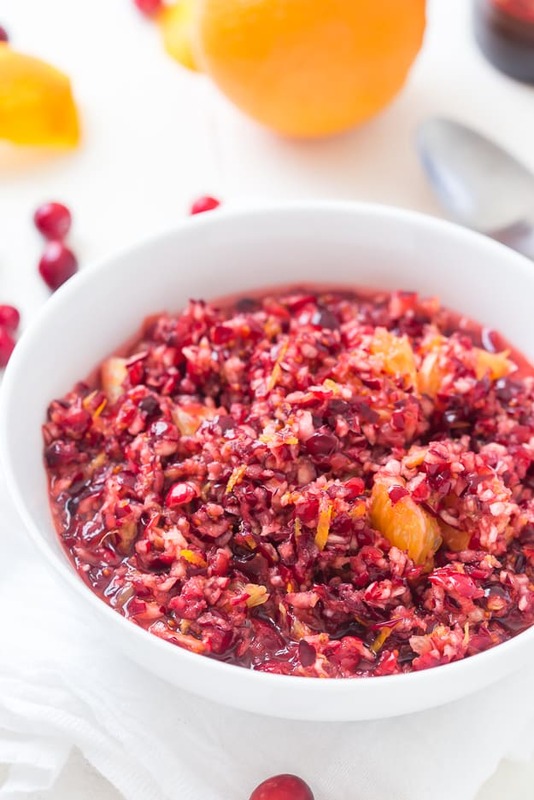 This sweet, but tart Cranberry Orange Relish Recipe is so easy and perfect for the holidays! Take a break from your traditionally served cranberry sauce and make this fresh relish instead. PIN IT TO YOUR THANKSGIVING BOARD ON PINTEREST TO SAVE IT FOR LATER! Before we start to get into out talk about cranberry sauce, let’s see what you are most looking forward to on Thanksgiving. I know I say this a lot, but I still can’t believe Thanksgiving is almost here. It was just October a few short days ago and now everyone, including myself, is talking about Thanksgiving. Time seriously needs to slow down, right? Now that little rant is out of my system; a let’s take a poll on who loves cranberry sauce. Do you like homemade cranberry sauce with fresh cranberries or the canned store-bought stuff? So the jelly store-bought cranberry sauce freaks me out a little bit. So you would say, I’m not a fan of it at all, but there are so many people who are. I prefer cranberry sauce with fresh cranberries, just like this Maple Cinnamon Cranberry Sauce recipe I have, chutney, or this cranberry orange relish recipe. 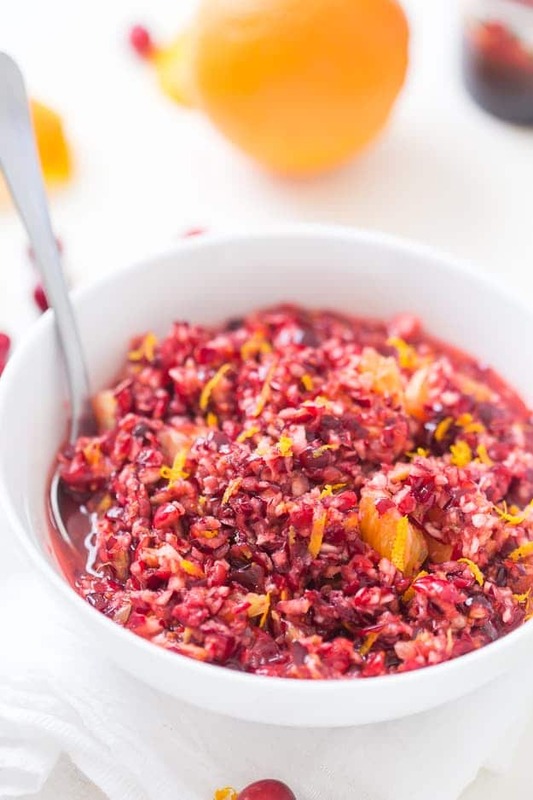 This cranberry orange relish recipe is a keeper because you get the tartness from the cranberries, the citrus flavor to balance out the bitterness from the orange and zest, and then the sweetness from a little bit of sugar. Oh, I can’t forget the pinch or two of salt to bring all of the flavors together. When I am using salt to bring the flavors together, I like to use a high-quality one. This Maldon sea salt is great, or even a Pink Himalayan is great. Here are some of my favorite side dishes for Thanksgiving: Lemon Butter Green Beans with Toasted Almonds Bacon & Feta (a mouth full to say, but so good! ), Life-Changing Easy Thanksgiving Stuffing, Garlic Roasted Red Potatoes, The BEST Green Bean Casserole, Slow Cooker Loaded Mashed Potatoes, and Crispy Garlic Smashed Potatoes. So many to choose from, I know! Are you thinking about serving appetizers? Here are a few I LOVE: Cranberry Orange Crostini, Mixed Olive and Whipped Feta Crostini, or Slow Cooker Cranberry Meatballs. Do you host Thanksgiving? We have and most likely will not for awhile because we are living in a fixer upper and our house is tiny (less than 800 square feet). We have a lot of work still to do, and we just do not have enough space – we barely have enough for two people and a cat! Maybe sometime in the far future. Place the cranberries into a food processor and pulse until finely chopped. Put the cranberries into a medium bowl and add the orange zest, diced oranges, and granulated sugar and toss to combine. 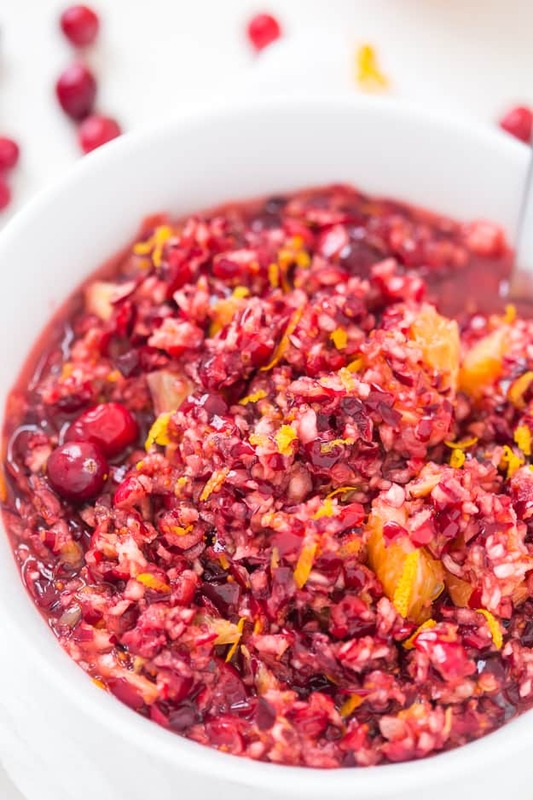 Add cranberry orange relish to a serving dish, garnish with orange zest, and serve.